The most extravagant carpet ever made in the history of mankind, described by Sir George Birdwood, a connoisseur of Indian jewelry, in 1879 as "the most wonderful piece of embroidery ever known," the Pearl Carpet of Baroda, gets its name from the Maratha Princely State of Baroda, one of the four Princely States of the Maratha Confederacy, that was ruled by the Gaekwar dynasty since 1740. 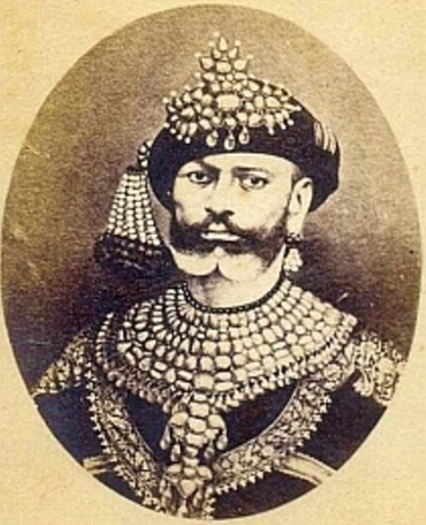 The Maharajah Gaekwar of Baroda Khande Rao who ruled between 1856 and 1870, was one of the most notable connoisseurs and collectors of jewels and jewelry in the history of the entire dynasty, who would have gone to any extent, despite the expenditure involved, to acquire any jewel that captured his interest in any part of the world, or create any fabulous piece of jewelry that took shape in his fertile mind, using the most highly skilled and experienced jewelry craftsmen, who had been trained in the Mughal tradition of jewelry crafting, who were at the disposal of his court. The Pearl Carpet of Baroda was one such creation commissioned by Geakwar Khande Rao, in 1860 and completed in 1865, that was meant to fulfill a vow he had made, to cover the tomb of the Holy Prophet of Islam, Prophet Muhammad, at Medinat-ul-Munawwara, the hallowed sanctuary, revered by Muslims all over the world. Gaekwar Khande Rao was a Hindu ruler, but was fascinated by Islam and its teachings, and ordered the carpets not only to fulfill a vow, but also to show his respect and admiration for Islam, a religion followed by a considerable number of his subjects. Covering the tombs of saints with expensive materials is a tradition prevalent among Indian Muslims to this day, and usually carried out in fulfillment of vows after their prayers have been answered. The carpet was referred to as a "Pearl Carpet," mainly because the dominant gems that were set in the carpet were seed pearls, over one million of them, even though there were other larger and more expensive gems incorporated such as diamonds, rubies, emeralds and sapphires. The rectangular-shaped pearl carpet has a length of 2.64 meters (8 ft. 8 ins) and a width of 1.73 meters (5ft. 8 ins. ), and is made of a combination of silk and deer hide. 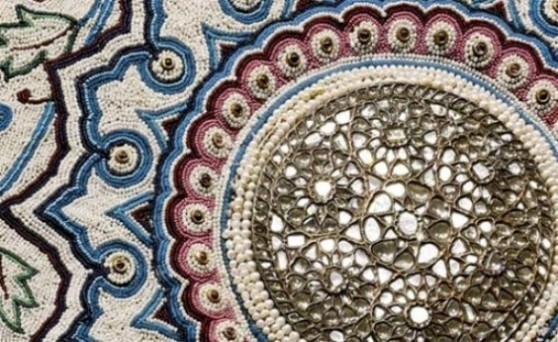 The carpet is densely embroidered, with its design picked out in colored glass beads, and the spaces filled entirely with an estimated 1.5 to 2.0 million natural seed pearls, known as "Basra Pearls" measuring approximately 1-3 mm and harvested in the southern Gulf region along the coasts of Qatar and Bahrain. The design of the carpet seems to have been inspired by the carpet designs of the Safavid period of Iran and the Mughal period of India, with dense fields of swirling flowering vines. Across the center of the carpet there are three large round "rosettes", placed symmetrically. The center of the rosettes are filled with large table-cut and occasional rose-cut diamonds, and are surrounded by strings of natural "Basra Pearls" slightly larger in size (3-4 mm) than the seed pearls found predominantly in other regions of the carpet. The diamonds are set in silver-topped gold or possibly blackened gold. The motifs are further enhanced with foil-backed rubies, emeralds and sapphires set in gold. Smaller diamond rosettes, 32 in all and embellished with sapphires, rubies and emeralds set in gold, are placed right round the border of the carpet. In between the smaller diamond rosettes, are found still smaller rosettes centered around a ruby and surrounded by eight other rubies, all surrounded by strings of seed pearls. An idea of the total number of pearls used in the carpet can be estimated by the following mathematical procedure. The total area of the carpet is 173 X 264 cmÂ² = 45,672 cmÂ². The average number of pearls and beads per dm (10 cm) in the length wise direction is 78, and in the breadth wise direction 64, which gives a density of 78 x 64 = 4992 pearls and beads per dmÂ²(100 cmÂ²). If we give an allowance of 500 cmÂ² for the area of the three larger rosettes and another 500 cmÂ² for the total area of the 32 smaller rosettes, the total area embroidered with pearls and beads become 45,672-1,000 = 44,672 or approximately 44,500 cmÂ². Given that 100 cmÂ² of the carpet carries approximately 5,000 pearls and beads, the estimated number of pearls and beads found in the carpet = 5,000/100 x 44,500 = 2,225,000. Assuming there are an equal number of pearls and beads in the carpet, the estimate of the number of pearls on the carpet becomes 1.1 million. Thus an estimation of 1.5-2.0 million may not be too far from the real figure. The total estimated weight of the pearls is 30,000 carats. The total number of table-cut diamonds in the rosettes is approximately 2,520, having a total weight of around 350 to 400 carats. The number of cabochon rubies in the carpet are over 1,000 and Colombian emeralds over 600. The Pearl Carpet of Baroda- peripheral rosettes. The Pearl Carpet of Baroda is indeed a diamond-and-pearl-encrusted masterpiece of 19th century India. 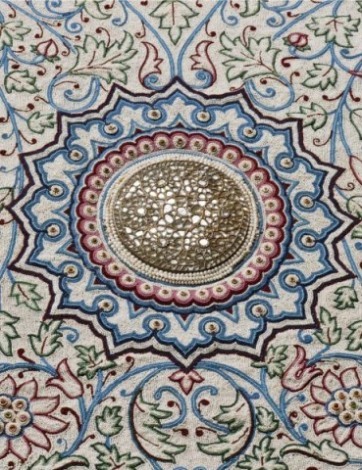 The genius of the designers had been clearly demonstrated in turning out a rug of regular and symmetrical design, with mathematical precision, from a multitude of pearls, diamonds, rubies, sapphires and emeralds of varying gauges, that testifies to their skilled workmanship and complete mathematical understanding. The exquisite execution, and the highly unusual combination of form and material, make the Pearl Carpet of Baroda one of the most remarkable objects ever created, on par with the legendary Peacock-Throne of Shah Jahaan, the most splendorous throne ever created in the history of mankind. The Pearl Carpet of Baroda which was mainly composed of an estimated 1.5 million Basra pearls, is a living testimony to the flourishing pearl trade that existed in the past between the Persian Gulf and the Indian subcontinent. The Persian Gulf, the Red Sea and the Gulf of Mannar were the hub of the international pearl trade since ancient times. The history of pearling in the Persian Gulf dates back to over four millennia, and the Persian Gulf was historically the oldest and most prolific pearl banks in the world, whose pearls entered the courts of the kings and emperors of ancient kingdoms, such as those of Egypt, Greece, Rome, Phoenicia etc. The island of Bahrain, known as Tylos by the Greeks and Romans, had a concentration of pearl bearing reefs, around which a pearl fishery existed since time immemorial. The Greek historian Isidorus of Charax, also refers to the pearl fisheries in the Island of Bahrain in the 3rd century BC. The Pearl banks of the Persian Gulf are mainly found on the Arabian side of the Gulf, and extend from Kuwait and the island of Bahrain in the west to Oman on the tip of the Arabian peninsula. Besides Bahrain, other important pearling areas in the Gulf were situated off the coast of Kuwait, the island of Dalmah off Abu Dhabi, Abu Musa, Hormuz, and the Lavan-Kish island group on the Persian side. Unlike other pearl banks such as the Gulf of Mannar, and the pearl banks of the new world discovered by the Spanish in Venezuela, Panama etc. which were decimated by over fishing due to government sponsorship, the pearl banks of the Gulf were never over exploited, and sustained pearl fishing continued for many centuries without any interruption. The main pearl oyster species around which the Persian Gulf pearling was based, was Pinctada radiata, which can attain a maximum size of 7 to 8 cm, and produces mainly seed pearls, and some individual pearls of medium size. Seed pearls are sometimes produced as clusters inside the oysters. A single cluster may sometimes contain over a hundred pearls. The seed pearls produced in the pearl banks of the Gulf are known as "Basra Pearls" because most of these pearls eventually ended up in the pearl markets of Basra, the closest commercial center, from where they found their way to other famous pearl markets in the world, such as Bombay and London. From the 16th to the beginning of the 20th century, Arab pearl dealers from the gulf preferred to send their pearls to the Bombay market, where their products fetched a much higher price than the London markets. The Mughal emperors of this period, and the other maharajahs were ready to pay much better prices for the Gulf pearls, and hence the higher prices realized at the Bombay markets. Much of the "Basra Pearls" set on the Baroda Pearl Carpet also reached Bombay in a similar manner, and were purchased by the agents of Khande Rao Gaekwar, who appears to have selected the best material available in the market for this purpose. The art of carpet weaving seems to be as old as civilization itself, and have been ascribed to the ancient Egyptians, Mesopotamians and the ancient Iranians. However there is no convincing archaeological evidence to support any of these claims, as materials used in carpets such as the hides of animals, wool, silk and cotton undergo decay and are very rarely unearthed in archaeological excavations. Archaeologists believe that carpet weaving was invented by people whose main occupation was cattle rearing. Ancient inhabitants of the Iranian Plateau whose main occupation was agriculture and cattle raising were believed to be one of the first group of peoples from whom the art of carpet weaving originated. When these people gradually became familiar with the utilization of wool and its properties, the first thing they would have turned out would have been clothing to cover oneself from the inclement weather. Thus weaving of clothing material preceded those of carpets in human cultural evolution. One of the most ancient carpets in the world was discovered in 1949 from a large coffin (sarcophagus) of an ancient Pars ruler (satrap) near his mummified body, by Prof. Rodlenko in the border of Moqolestan, a region called "Pazirik," under piles of ice. The age of the partially preserved carpet determined by carbon-dating showed that it was woven in the 5th century BC. The dimensions of this rectangular carpet was 9.3 ft. by 6.5 ft (2.83 by 2.00 meters), and the carpet has 36 symmetrical knots per cmÂ². The advanced weaving technique employed in this carpet shows that the art of carpet weaving must be much older than the age of the carpet itself. Thus the "Pazirik" carpet is a result of a long period of evolution of the technique of carpet weaving, which perhaps extended back several thousand years from 5th century BC. Motifs used in this carpet such as a mythical winged creature, a yellow-spotted dear and a man mounted on a horse or standing near it, point to the Iranian origin of this carpet. The yellow spotted dear is a rare animal whose main habitat was near the shores of the Caspian Sea in the north of Iran. 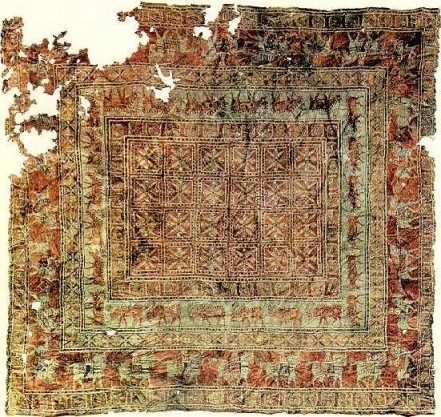 Archaeologists believe that the "Pazirik" carpet, which is preserved in the Hermitage Museum of Leningrad, is a product of the Archaemenid period of Iran. In the 5th century BC, the Archaeminian Court of Cyrus the Great at Pasargade was decked with magnificent carpets according to historical records. When Alexander the Great of Macedonia invaded Iran he was said to have been dazzled by the carpets in the tomb area of Cyrus the Great at Pasagarde. The earliest known bejeweled carpets adorned with jewels, pearls and gold date back to the Sassanian period between the 3rd and 7th centuries AD in Iran. According to Prof. Pope during the rule of the Sassanian king Khusraw II between 590 and 628 AD, the throne room in his palace at Ctesiphon was covered with carpets made of gold-woven fabrics with pearls embroidered on them. One of the largest carpets ever made with dimensions of 450 ft by 90 ft (140 m by 27 m) depicting a garden in full bloom, known as the "spring carpet" or "winter carpet" covered the main audience hall of the Sassanian Imperial Palace at Ctesiphon during the reign of Khusraw II, and was made of wool, silk, gold and silver, and elaborately decorated with gemstones and pearls. The King is said to have strolled along that seemingly endless, bejeweled carpet in the winter time to savor its many spring time scenes - birds in flight, flowers in full blossom, ripe fruits, and a broad green meadow border, believed to have been designed of solid emeralds. The fables of the Arabian Nights, Alf Lailah wa Lailah - a Thousand and one nights, written towards the end of the 9th century AD, mentions of carpets decorated with pearls, rubies and turquoise, which seems to have derived its inspiration from real carpets that adorned the palaces of the Abbasid Caliphs of the period. 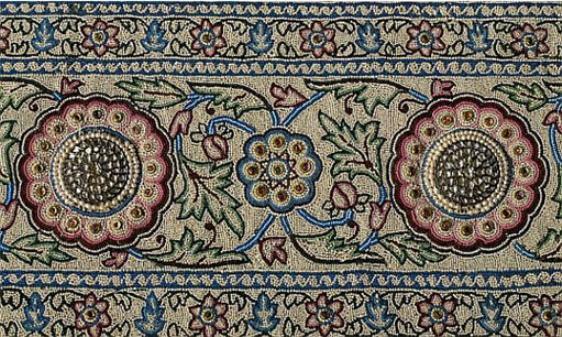 Thus the Pearl Carpet of Baroda represents a 19th century revival of the ancient art of encrusting carpets with jewels. Encrusting royal apparel with gemstones and pearls was another practice that had been prevalent in the courts of mighty rulers, such as the Mughal emperors of India, the Shahs of the Safavid dynasty of Persia, and the Sultans of the Ottoman Empire. 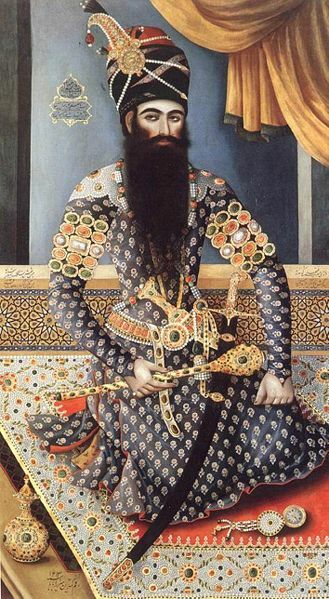 Among the Mughal rulers Shah Jahaan was well known for the pomp and pageantry of his court, and the extraordinary brilliance of his apparel and throne, including the famous "Peacock Throne" brought about by encrustation with gemstones such as diamonds, emeralds, sapphires, rubies, pearls etc. set on gold and silver. Among the Safavid rulers of Iran, Fath Ali Shah was the most well known for the extraordinary brilliance of his court, which emanated from the jewel encrusted throne, apparel, as well as the crown. The use of jewel-studded fabrics during the Ottoman period, is illustrated in a portrait of Mehmet II - one of the most powerful sultans of the Ottoman empire, who captured Constantinople in 1453 and brought an end to the Byzantine empire - in which Gentile Bellini, depicted the Sultan in an architectural niche partially covered with a bejeweled fabric, whose embroidery echoes the Renaissance bas-relief carving of the arch framing the sitter. The Maratha Princely State of Baroda with an area of approximately 8,300 square miles was situated 250 miles north of Mumbai in mid-western India. Even though the year of founding the state is 1732, when the Maratha general Pilaji Rao Gaekwad conquered Baroda City from the Mughal Empire, the region has a very ancient history dating back by about 2,000 years. Vadodara, as it was known in ancient times came under the sway of powerful Hindu rulers of dynasties such as the Guptas, Chalukyas, and the Solanki Rajputs, until the 13th century, when the region was captured by the Delhi Sultanate who ruled for over 300 years, and were themselves overthrown in the 16th century by the powerful Mughal rulers. During the period of the Mughal Empire the Maratha Hindu warriors of the region began their incessant military campaigns to defend their religion and to win back control of their ancestral territories from the foreign invaders. 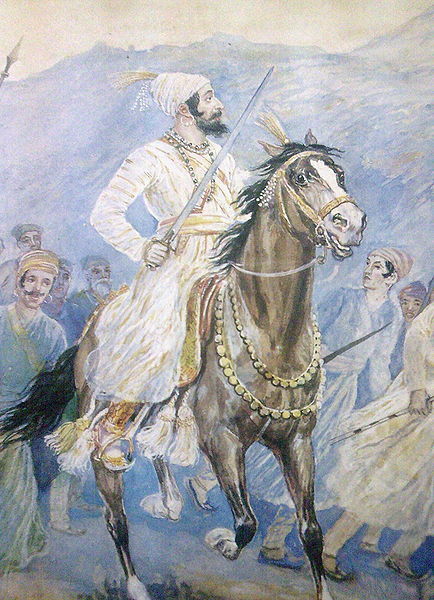 Maharaj Chhatrapati Shivaji (1630-1680), a brilliant Marathi soldier and tactician, was able during his life time to challenge the might of the Mughal Empire and inflict defeat after defeat on the mighty Mughal army, that finally led to the establishment of the Maratha Empire. Mughal Emperor Aurangzeb's relentless efforts to defeat Shivaji and his successors and destroy the Maratha Empire, proved futile, and costly, and led to the depletion of the wealth and resources of the empire, that eventually led to his death and downfall in 1705. For the next 80 years Aurangzeb's heirs never challenged Maratha power, and the Peshwa Marathas established themselves as the dominant power in their region, capturing all territories that was once under the Mughal Empire. In the year 1732, the Maratha General Pilaji Rao Gaekwad, the founder of the Gaekwad dynasty, captured the city of Vadodara from the Mughals, and the city was then given as a fief to Pilaji Rao Gaekwad by the Peshwa, the leader of the Maratha Empire, in recognition of his contribution to the war effort against the Mughal Empire. Eventually, Pilaji Rao's son Damaji Rao Gaekwad consolidated power over large areas of Gujarat and assumed the status of an independent ruler, and Baroda became part of a loose confederacy, known as the Maratha Confederacy, the other constituent states in this confederacy being Indore, Gwalior, Nagpur and Poona. Baroda joined the Maratha Confederacy in fighting the British at the first Anglo-Maratha War. However, in 1802, the British intervened on behalf of Maharajah Gaekwar Anand Rao of Baroda, who had recently inherited the throne, against rival claimants. The Gaekwad rulers then concluded a treaty with the British, that recognized their independence from the Maratha Empire, and guaranteed the Maharajahs of Baroda local autonomy, in return for recognizing British suzerainty. The arrangement with the British not only ensured the continued existence of Baroda as a Princely State, but also the continuation of the Gaekwar dynasty as the main ruling family of the state. According to the agreement the British received a share in the state revenue, and was given representation in the Maharajah's court by a British Resident. Since Pilaji Rao Gaekwar founded the Gaekwad dynasty between 1721 and 1732, there had been 13 Gaekwad Maharajahs of Baroda, until the year 1947, when the last Gaekwad of Baroda, Pratap Singh Gaekwar acceded to the new Indian Republic and Vadodara became part of Bombay State. Out of the 13 Gaekwad Maharajahs of Baroda the one that became most well known for his lavish spending and extravagant tastes was Khande Rao Gaekwar, who ruled between 1856 and 1870. He was one of the greatest collectors and connoisseurs of jewels and jewelry in the 19th century. One of his remarkable acquisitions was the 128.48-carat "Star of the South Diamond," the first Brazilian diamond to acquire international fame due to its extraordinary quality and was purchased by Khande Rao Gaekwar for Â£80,000 in 1867. The Prince was so enthused with this purchase, that he staged a massive celebration to welcome the "Star of the South Diamond" to India, that included a parade of his elephants adorned in their finest gilded arrays. Subsequently the Maharajah also purchased the 76.5-carat drop-shaped "English Dresden Diamond" and eventually got both stones incorporated as the centerpiece of a triple-tiered diamond necklace, that came to be known as the "Baroda Diamond Necklace." Other extravagant pieces of jewelry designed during the period of Khande Rao Gaekwar included the seven-stranded diamond and emerald necklace known as the "Hindu Necklace," and the legendary seven-stranded natural pearl necklace, which came to be known as the "Baroda Pearl Necklace," two of the most expensive pieces of jewelry owned by him. He is also reported to have purchased several pieces of jewelry that once belonged to Empress Eugenie, empress consort of Napoleon III. What prompted Gaekwar Khande Rao to commission such an extraordinary carpet ? The chronological sequence of his lavish purchases, seem to suggest that the "Pearl Carpet" was one of his first extravagant acquisitions which he commissioned in 1960, just 4 years after his ascension to the throne of Baroda, and took five years to complete, with over a hundred of his court artisans actively involved in the project. The primary aim in executing this lavish carpet according to authentic sources, was to fulfill a vow which Khande Rao Gaekwar had taken to cover the tomb of the Prophet of Islam, in Medina, probably as a reciprocation for prayers answered or as a mark of respect and admiration for Islam, a religion followed by a sizeable population of his domain. Some writers even suggest that the extravagancy of the carpet produced seem not only to show his fascination and respect for the religion of Islam, but also his inherent inclination towards it, even though he was not able to express it outwardly being a Hindu Maharajah of a predominantly Hindu State. However, the fact that the carpet was commissioned just 4 years after his ascension to the throne, seem to indicate that the first reason adduced, viz. the fulfillment of a vow, is the more plausible explanation. Some writers have opined that by turning out such an extraordinary carpet to cover the tomb of the Prophet Muhammad, Khande Rap Gaekwar was actually emulating the mighty Mughal Emperor Shah Jahaan, who too adorned the tomb of his beloved wife, Mumtaz Mahal by covering it with an expensive jeweled carpet, and by so doing demonstrated his status as a rich and powerful monarch, equivalent to the mighty rulers of the Mughal Empire. Was Pearl Carpet of Baroda one of a suite of four carpets or one of two carpets made in duplicate ? According to Sir George Watt, who wrote a book on the Indian Art Exhibition held in 1902-1903, titled "Indian Art at Delhi" at which the Pearl Carpet of Baroda was exhibited, the carpet is actually one of four such pieces that originally formed a suite of carpets. Sir George Watt wrote, "Perhaps if any one article could be singled out as more freely discussed at the exhibition than any other, it would be the pearl carpet of Baroda. The circular portion shown in the plate was probably originally intended as the veil or canopy, and the rectangular carpet shown on the walls of the Loan Collection Gallery close by is one of the four such pieces that are said to have formed the carpet. 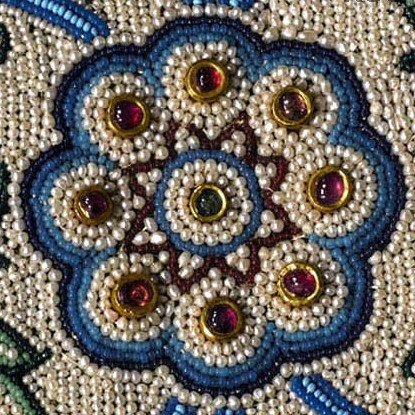 The field is in seed pearls, the Arabesque design in blue and red being worked out in English glass beads, with medallions and rosettes of diamonds, rubies, emeralds, freely dispersed. To place on the four corners of the carpet were constructed four large weights in solid gold, thickly set with diamonds. Needless to add that this superb gift never went to Medina"
Another publication, "A year with the Gaekwar of Baroda" written by a visitor to the palace, the Reverend Edward St. Clair Weeden, and published in 1909 describes the carpets in the following words :- "Four great squares, each as large as a fair-sized carpet, which hung on the walls, apparently of tapestry. 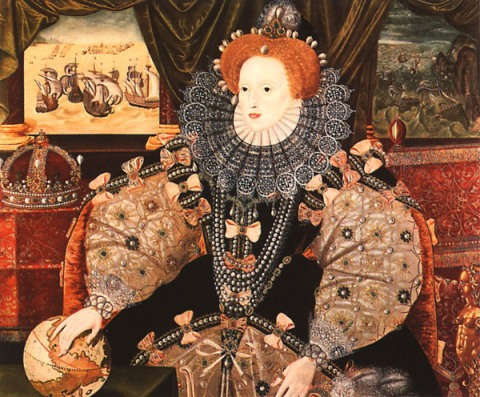 Closer inspection showed that they consisted entirely of jewels - pearls, emeralds, rubies, diamonds and so on." Weeden also says that the Maharajah died before the gift could be sent to Medina, and his successors did not feel compelled to carry out his wishes. Thus from the foregoing accounts it is apparent that the Pearl Carpet of Baroda, as we know it today, was actually one of a suite that originally consisted of four rectangular pieces, a circular piece and four finials. The whole suite could be assembled to form a canopy for the Prophet's tomb in Medina. Four gold finials or posts were to be manufactured to serve as support for the canopy. But the Maharajah died before the gold finials could be completed. However, according to E. L. Tottenham who visited the palace in 1914, there was only one rectangular carpet still hanging from the walls. His account reads as follows :- "Upon the wall hung the oblong-shaped (rectangular) famous pearl carpet. It was made in duplicate, the first to be dispatched to Medina to go over the tomb of the Prophet Mohammed. This one now only remained. Its value at the time of making was 68,500 rupees, but this day it was worth 2 lakhs (two hundred thousand rupees). The piece consisted of three big diamond-set flowers along the middle portion, and thirty-three smaller flowers, along the border. In the floral design are 1,269 rubies and 596 emeralds. The remaining portion of the carpet, in size 6 feet by 10 feet, is made of seed pearls, except the blue, green and red lines in the floral design, which are of colored glass beads." From the above account it is apparent that the carpet was made in duplicate and the original was to be dispatched to Medina, and now only the duplicate carpet remained. Was Gaekwar Khande Rao able to dispatch the Pearl Carpet to Mecca before his death ? The above account given by E. L. Tottenham does not specifically mention whether the pearl carpet was actually sent to its intended destination at Medina, the tomb of the Holy Prophet. Neither does it say that the donor of the said carpet died before it could be delivered to its intended destination. The account only says that the original was to be dispatched to Medina, and what remained now was the duplicate. This account creates an ambiguity in the mind of the reader about the actual fate of the original carpet. The question that now arises is, if the original carpet was not sent to Medina, what was the ultimate fate of this carpet? However, apart from Tottenham most other authors are of the view that the carpet or suit of carpets was never delivered to Medina, as the Maharajah died before his wishes could be fulfilled. If we accept the view that Baroda Pearl Carpet was actually a part of a suite of carpets which was not delivered to Medina, then the question arises about the fate of the other three carpets in the suite. At the time Tottenham visited the palace in 1914, what remained of the suite was only a single rectangular-shaped carpet and the circular canopy, which means that the missing three carpets were disposed of either during the reign of Khande Rao Gaekwar's brother Mulhar Rao Gaekwar (1870-1875), or Sayyaji Rao III Gaekwar (1875-1939), the most enlightened of all the Gaekwars who contributed a great deal for the social and economic upliftment of the people of Baroda. The Pearl Carpet of Baroda has since its creation impressed writers as an extraordinary work of art, and most of them have paid glowing tributes to it in their writings. One such tribute was paid by Sir George M. Birdwood in 1880. He wrote :- "But the most wonderful piece of embroidery ever known was the chaddar or veil made by order of Khande Rao, the late Gaekwar of Baroda, for the tomb of Prophet Mohammed at Medina. It was composed entirely of inwrought pearls and precious stones, disposed in an Arabesque pattern, and is said to have cost a crore (10 million rupees). Although the richest stones were worked into it, the effect was most harmonious. When spread out in the sun it seemed suffused with a general iridescent pearly bloom, as grateful to the eyes as were the exquisite forms of its arabesques." Michael White writing an article in the New York Times of May 13, 1906, on the topic, "How Maharajah Gaekwar Became Ruler of Baroda," stated that, "Maharajah Gaekwar possesses the most costly piece of jewelry in the world. In dazzling magnificence, it never has been, or is ever likely to be excelled. This treasure is in the form of a shawl or cloak of woven pearls, edged with a deep border of arabesque designs of diamonds, rubies, emeralds and sapphires." Stuart Cary Welch sounds philosophical when he made the following comments :- "However unbridled the opulence of its million pearls of excellent quality, of its fine diamonds, rubies and emeralds beyond count, the design is suitably restrained and dignified, a classic arabesque descended from the Mughal tradition and probably inspired by the legendary jeweled covering ordered by Shah Jahaan to adorn the cenotaph of Mumtaz Mahal in the Taj Mahal. If one approaches with an eye only for worldly delight, or even amusement, one soon backs off, sensing the degree of underlying seriousness and religious devotion." Thus according to Tottenham what remained of the pearl carpets during his visit to the Gaekwar Palace in 1914, and was exhibited on the walls of the palace, was the rectangular-shaped pearl carpet and the circular jeweled canopy. This was during the enlightened period of Sayyagi Rao III Gaekwar, who ruled between 1875 and 1939. Sayyagi Rao III Gaekwar was succeeded by his grandson Pratapsingh Rao Gaekwar, who ruled from 1939 to 1947, and was the last Gaekwar of Baroda, before the princely state was absorbed into the new Indian Republic created in 1947. 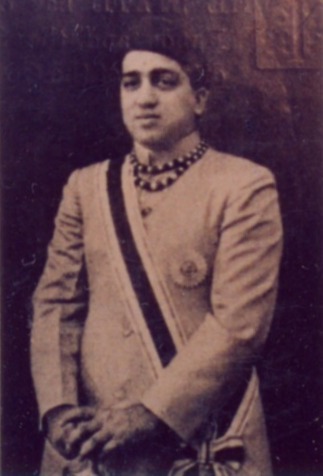 Pratapsingh Rao inherited most of the Baroda Crown Jewels, that included the jewels and jewelry acquired during the period of Khande Rao Gaekwar, such as the "Star of the South Diamond," the "English Dresden Diamond," Baroda Diamond Necklace, Baroda Pearl Necklace, the Hindu Necklace and the Baroda Pearl Carpet and Canopy. Pratapsingh Rao Gaekwar has gone down in history as the only Gaekwar who took a second wife while his first wife was still living. Please refer to Chalk Emerald Ring for the full story of this marriage. His second wife Sita Devi was previously married to the Zamindar of Vayyur, and first obtained a divorce from him before marrying Pratap Singh Gaekwar. Sita Devi's marriage to Pratapsingh Rao Gaekwar is compared to the marriage of Wallis Simpson a divorcee who married King Edward VIII of The United Kingdom after his abdication, and became the Duchess of Windsor after her husband's title of Duke of Windsor. The western media referred to Sita Devi as India's Wallis Simpson. After World War II, in 1946, Pratapsingh Rao purchased a magnificent mansion in Monaco, which he converted to a second palace, where his second wife Sita Devi took up permanent residence. It was after this that Pratapsigh Rao Gaekwar moved cabin loads of the great treasures of Baroda State, which included the Baroda Pearl Carpet and Canopy to his new palace in Monaco, and Maharani Sita Devi was made the custodian of these treasures. What prompted him to do so immediately after World War II is not quite clear, but perhaps it was his knowledge of the local and international political climate, the independence movement of India that was gathering momentum at the time and his belief that the British, who were the protectors of the Gaekwar dynasty, might decide to pull out of India at any moment. Before India became a republic in 1947, Maharani Sita Devi had already got the ownership of most of the Baroda treasures including the Baroda Pearl Carpet and Canopy transferred in her name. She then got Van Cleef & Arpels based in Paris to remove most of the jewels from their old settings and remount them in new settings. Fortunately, she decided to keep the Pearl Carpet of Baroda, in its original pristine state, untouched, probably because of the intricate designs and the sheer beauty of the piece, which she new very well was irreplaceable. It is said that the Pearl Carpet of Baroda was kept in a bank vault in Geneva, Switzerland. After the Princely State of Baroda acceeded to the Indian Union in 1947, the Government of India took over the Baroda treasury and was shocked to find that the treasury was almost empty. 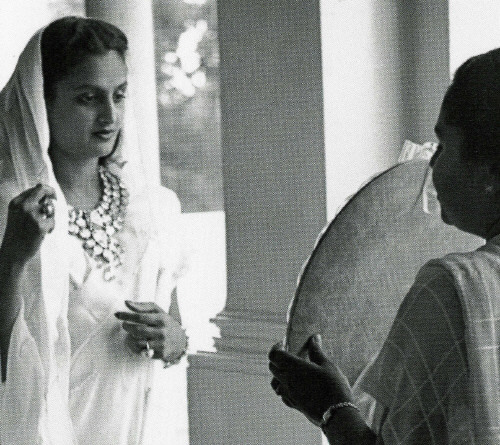 The Government forced the Maharajah to return the treasures under threat of abdication, but only some of the treasures were eventually returned such as the 7-stranded pearl necklace now reduced to six strands and the "Star of the South Diamond." In 1951, the Maharajah was forced to abdicate in favor of his son by his first wife Fatehsingh Rao Gaekwar. Pratapsingh Rao moved to Monaco where he lived with his second wife Sita Devi and their only son Princie. Fallen from power and denied of the privileges and special government purse paid to the ex-Maharajahs of Princely States, they now resorted to selling their jewels and jewelry for their survival. Soon misunderstandings developed between husband and wife , that led to severe estrangement and finally divorce in 1956. Pratapsingh Rao now moved to London where he took up residence, and eventually died in exile in 1968. Sita Devi's problems worsened after her husband left her, and she was forced to pledge some of her jewelry and eventually sell some of them at an auction held in Monte Carlo in 1974 that netted $4 million. In the year 1985, she lost her only son Princie who was 40 years of age, apparently by suicide, caused by alcoholism and drug addiction. Just one year after the death of her son she too died in France at the age of 69 years. When was the Baroda Pearl Carpet sold by Maharani Sita Devi ? It is not known exactly when the Baroda Pearl Carpet was sold by Maharani Sita Devi. The identity of the new owner of the carpet including his nationality was equally unknown. However it is believed that the carpet must have changed hands at the secret auction of her jewels held in Monte Carlo in 1974, organized by Credit Mobilier of Monaco, at the height of her pecuniary problems. The sale of her jewels netted a total of $4,000,000 and it is believed that a substantial proportion of this amount included moneys realized from the sale of the carpet. The price at which the carpet was sold in 1974 is also unknown, however, the new owners of the carpet were believed to be a ruling family from the Middle East. 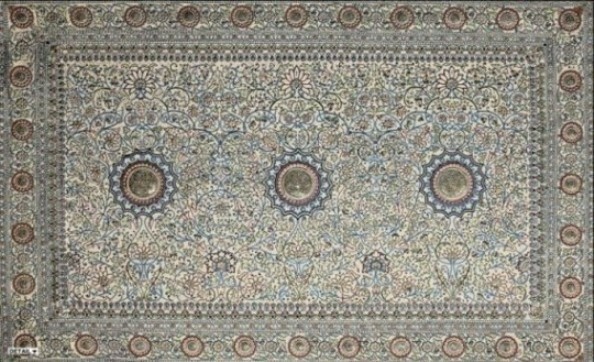 The Baroda Pearl Carpet was last exhibited in 1903, at the Indian Art Exhibition held at the Qudsia Gardens in Delhi, during the Delhi Durbar of 1903. The Maharajah of Baroda at the time, Sir Sayyaji Rao III Gaekwar, allowed it to be displayed as a mark of respect for the British Sovereign. This was the first time the carpet was released by the Royal Palace of Baroda for public viewing since its creation in 1865. The carpet remained in India at the Royal Palace of Baroda, until 1946, when it was taken to Monaco. After its first exposition in Delhi in 1903, the carpet again resurfaced for public exposition only in 1985/1986 at The Metropolitan Museum of Art, in New York, at an exhibition titled "INDIA" held between September 14, 1985 and January 5, 1986. After the carpets appearance in 1985/1986, at New York, we here of it again in January 1994, when a news item appearing in Arabian and Indian newspapers, described the Baroda Pearl Carpet as a 400-year old prayer rug. The report described the rug as being decorated with three shining diamond centers in the middle, laced with pure gold and surrounded by pearls, rubies and emeralds. The report also quoted a Saudi-based agent Hisham-al-Baroodi as saying that he was negotiating with relevant Saudi Officials to take the rug to the kingdom, where he was confidant of finding a buyer. In February 2009, Sotheby's announced the auction of the Pearl Carpet of Baroda together with other objects, at the inaugural series of its sales in Doha, known as the "Arts of the Islamic World Auction" to be held on March 19, 2009, at their new auction hall at Level 15, Commercial Bank Plaza, Al-Markhiya Street, Doha. Bidding on the carpet was to start around US $5 million, but was expected to rise considerably higher reaching as much as $20 million. Mary Jo Otesa, Worldwide Director of Rugs and Carpets at Sotheby's said, "It is fitting that an historic object as magnificent and unique as the Pearl Carpet of Baroda is a major highlight of our inaugural series of auctions in Doha. The carpet has never appeared at auction before and the sale therefore represents an unparalleled opportunity to acquire an extraordinary significant work of art. I am delighted that middle eastern collectors will be able to view this stunning work." Sotheby's inaugural auction series was to begin with an exclusive exhibition of artifacts from March 14, 2009. A collection of Orientalist Art and Contemporary Art masterpieces was to be auctioned on March 18, 2009, and "Arts of the Islamic World Auction" was to be held on March 19, 2009. When the auction got underway on March 19, 2009, there were only three bidders for the carpet, and therefore the starting price was brought down to $4.5 million. An anonymous buyer who bid by telephone eventually bought the Baroda Pearl Carpet for $5.5 million, setting a new record for a carpet sold at an auction. The previous record for a carpet sold at an auction, was created in June 2008, when a 400-year old Persian Isfahan Carpet, was auctioned by Christie's in New York for $4.45 million. The fact that there were only three bidders for the carpet, which fetched only $5.5 million, far short of the pre-sale estimate of 20 million dollars, was a reflection of the falling demand for such collectors items in the face of the current world recession. The identity and nationality of the seller and the buyer were not disclosed by the auction house. Together with the Baroda Pearl Carpet, there were 18 other pieces lined up for sale, but eventually only five pieces sold. A gorgeous silk velvet hanging, showing elegantly dressed women walking in a garden, from early 17th century Safavid Persia sold for ten times its estimated value, at $3.4 million, after fierce bidding between six buyers. The winning bidder was reported to be a member of the Qatari royal family and the piece was destined for the new Museum of Islamic Art in Doha, which was opened in November 2008. The other auctions held earlier featuring Orientalist Art, Contemporary Art and watches, also turned in poor results, and the auction house made just $18 million, well short of the pre-sale total estimate of $30 million. Lord Poltimore, one of the two auctioneers in Doha, commented, "While the results weren't everything we expected, we feel positive for this sale in a new region. But we will review our position all the time."